Today’s post is from Brian Atwood, chair of the OECD Development Assistance Committee. ‘Transparent practices form the basis for enhanced accountability.’ This quote from the Busan Partnership for Effective Development Co-operation, agreed in Korea late last year, describes transparency as one of the pillars of a new framework for development co-operation that is founded on collective voluntary commitment to change behaviour and reinvigorate development. Institutions depend on transparency to facilitate the participation of citizens in the development process by building the relations and trust that unify citizens and governments – all governments. In donor countries, this is fundamental as providers of development co-operation are called on to respond to growing demands from their citizens for information on the “value for money” of development co-operation. Likewise, developing country citizens are increasingly insistent on knowing who development flows are benefitting and how. Yet beyond underpinning the relationship between governments and citizens, transparency is also essential to build trust among governments as they work together for development. There is a practical rationale as well: aid is more effective when regular, detailed and timely information on aid volumes and allocations is available, allowing developing countries to plan. By developing a culture of transparency we can connect citizens to development in unprecedented ways. Today, leaders at the highest level of government must focus as never before on the importance of development progress in addressing the world’s most difficult issues, from disease to conflict to jobs. As development finance resources – like all public resources – face increased scrutiny, transparency can mean enhancing confidence in programs and trust in relationships. The Busan agreement is about development led by the developing world. This means having country systems capable of tracking internal and external expenditures. It also means having the capacity to map strategic objectives, establish effective indicators and measure results. In a developmental state, knowledge and access to information represent the power to succeed. Efforts to support countries’ statistical capacity by donors like the World Bank and initiatives like Paris21 have led to major advances in creating and strengthening national statistical systems. The Global Partnership that emerged from Busan also fully supports an enabling environment for CSOs, promoting development communication and media participation. The OECD DAC will continue to work with the Global Partnership to strengthen and support advances in these areas. The OECD DAC’s Creditor Reporting System database is regarded as the gold standard in producing verified, comprehensive, high quality official statistics to track aid flows. The International Aid Transparency Initiative (IATI) provides an important and complementary vehicle for advancing transparency by making data more frequently available and publishing a wider range of detailed aid information. IATI has succeeded in mobilising political support around this important issue. Donors representing 70-80% of ODA are now signatories to the initiative, with the United States being the latest major donor to endorse it, in Busan. Yet predictability – information on planned aid flows – is also essential. The OECD DAC conducts the only regular process that brings together the bulk of global bilateral and multilateral aid spending plans for up to three years in advance. This information is essential to enable developing countries to do advance planning and in this respect also, transparency is the answer. The Busan Partnership, the most inclusive agreement on global co-operation for development to date, provides a platform for engagement and dialogue across a range of stakeholders – developing countries, emerging economies, traditional donors, the private sector and civil society – to support a culture of transparency and capacity building in national institutions and systems. 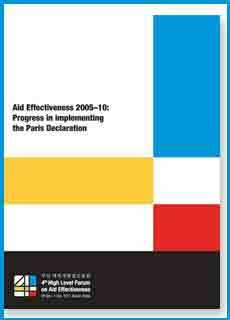 Likewise, the OECD DAC has placed transparency at the core of its efforts to enable effective development. We stand ready to apply our technical expertise and know-how to the urgency of this agenda. We call on the development community to join us, making transparency a centrepiece of the development cooperation effectiveness called for in Busan. I’m happy that the “Busan Partnership for Effective Development Co-operation” is putting emphasis on transparency as cornerstone for development. OECD is doing an excellent job about the integration of transparency in the international co-operation. Furthermore,throughout the Life Cycle Assessment and the Life Cycle Thinking, the UNEP-SETAC is trying as well to integrate transparency in the Corporate Social Responsibility specificly in the Responsible Purchasing and by extension in the whole Life Cycle Assessment tools and methodology (Social Life Cycle Assessment and Sustainable consumption and production). I think as well that it’s really relevant to put emphasis on trust within citizens and institutions in this transitional period in order to reduce the life cycle of the transitional period and by extension, reduce the transitional effects and accelerate the shift of our productive structure towards the sustainability. Furthermore, i think that transparency will become the cornerstone of trust, peace and social cohesion and justice and sustain by extension the effective and efficient global collaborative and cooperative framework for world’s sustainable development initiative. I’m happy and thankful that OECD and other international institutions are working hard to favour already the emergence of those framework (OECD DAC’s Creditor Reporting System database, IATI). The US government still committing as well for more transparency in our diplomacy.